Angeboten wird die folgende Kombination. 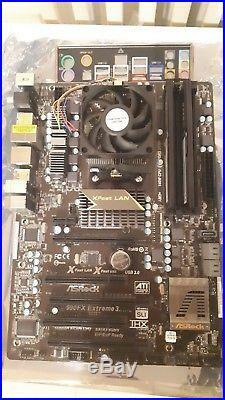 Mainboard ASROCK 990fx Extreme3. Support for Socket AM3+ processors – Support for Socket AM3 processors: AMD Phenom II X6 / X4 / X3 / X2 (except 920 / 940) / Athlon II X4 / X3 / X2 / Sempron processors – Supports 8-Core CPU – Supports UCC feature (Unlock CPU Core) – Digi Power Design – 4 + 1 Power Phase Design – Supports CPU up to 140W – Supports AMD’s Cool’n’ Quiet Technology – FSB 2600 MHz (5.2 GT/s) – Supports Untied Overclocking Technology – Supports Hyper-Transport 3.0 (HT 3.0) Technology. Northbridge: AMD 990FX – Southbridge: AMD SB950. Dual Channel DDR3 memory technology – 4 x DDR3 DIMM slots – Supports DDR3 2100(OC)/1866. /1333/1066/800 non-ECC, un-buffered memory – Max. Capacity of system memory: 64GB. 1866/1800/1600MHz memory speed is supported depend on the AM3/AM3+ CPU you adopt. For detail CPU specification, please refer AMD official website. To reach the maximum 64GB of system memory, memory modules with 16GB capacity or above are required. ASRock will update the memory support list on the official website once these memory modules are available on the market. Due to the operating system limitation, the actual memory size may be less than 4GB for the reservation for system usage under Windows. 64-bit OS with 64-bit CPU, there is no such limitation. 32Mb AMI UEFI Legal BIOS with GUI support – Supports “Plug and Play” – ACPI 1.1 Compliance Wake Up Events – Supports jumperfree – SMBIOS 2.3.1 Support – CPU, VCCM, NB, SB Voltage Multi-adjustment. 7.1 CH HD Audio with Content Protection (Realtek ALC892 Audio Codec) – Premium Blu-ray audio support. PCIE x1 Gigabit LAN 10/100/1000 Mb/s – Broadcom BCM57781 – Supports Wake-On-LAN – Supports Energy Efficient Ethernet 802.3az – Supports PXE. Quad SLI and SLI. 5 x SATA3 6.0 Gb/s connectors, support RAID (RAID 0, RAID 1, RAID 5 and RAID 10), NCQ, AHCI and Hot Plug functions – 1 x IR header – 1 x COM port header – 1 x HDMI_SPDIF header – 1 x Power LED header – CPU/Chassis/Power FAN connector – 24 pin ATX power connector – 8 pin 12V power connector – Front panel audio connector – 3 x USB 2.0 headers (support 6 USB 2.0 ports). I/O Panel – 1 x PS/2 Mouse Port – 1 x PS/2 Keyboard Port – 1 x Coaxial SPDIF Out Port – 1 x Optical SPDIF Out Port – 6 x USB 2.0 Ports – 2 x USB 3.1 Gen1 Ports (Etron EJ168A) – 1 x eSATA3 Connector – 1 x RJ-45 LAN Port with LED (ACT/LINK LED and SPEED LED) – HD Audio Jack: Side Speaker / Rear Speaker / Central / Bass / Line in / Front Speaker / Microphone. ASRock Extreme Tuning Utility (AXTU) – ASRock Instant Boot – ASRock Instant Flash – ASRock APP Charger – ASRock APP Shop – ASRock XFast USB – ASRock XFast LAN – ASRock XFast RAM – ASRock On/Off Play Technology – Hybrid Booster: – CPU Frequency Stepless Control – ASRock U-COP – Boot Failure Guard B. Turbo 50 / Turbo 60 CPU Overclocking – Turbo UCC. Drivers, Utilities, AntiVirus Software (Trial Version), CyberLink MediaEspresso 6.5 Trial. 1 x ASRock SLI_Bridge_2S Card – Quick Installation Guide, Support CD, I/O Shield – 2 x SATA Data Cables – 1 x 3.5mm Audio Cable. CPU Temperature Sensing – Chassis Temperature Sensing – CPU/Chassis/Power Fan Tachometer – CPU Quiet Fan – CPU/Chassis Fan Multi-Speed Control – Voltage Monitoring: +12V, +5V, +3.3V, Vcore. ATX Form Factor: 12.0-in x 8.6-in, 30.5 cm x 21.8 cm – All Solid Capacitor design (100% Japan made high quality conductive polymer capacitors). 10 64-bit / 8.1 32-bit / 8.1 64-bit / 8 32-bit / 8 64-bit / 7 32-bit / 7 64-bit / Vista 32-bit / Vista 64-bit / XP 32-bit / XP 64-bit. Speicher Corsair 8GB XMS 3. 2 x 4 GB Speichermodule. Dichte: 8 GB (2 x 4 GB). Default TDP / TDP. The item “HardwareBundle ASRock 990FX Extreme3 + AMD FX 6300 Six-Core + 8GB DDR3 Corsair” is in sale since Sunday, February 25, 2018. This item is in the category “Computer, Tablets & Netzwerk\Computer-Komponenten & -Teile\Mainboard & CPU-Kombination”. The seller is “mirabella91″ and is located in Hannover. This item can be shipped worldwide.